Get a LEIRSUND Slatted Bed Base for $50 + More! 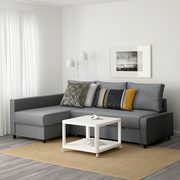 IKEA IKEA Limited-Time Deals: FRIHETEN Corner Sofa-Bed $499, LEIRSUND Adjustable Slatted Bed Base $50 + More Get a LEIRSUND Slatted Bed Base for $50 + More! Enjoy nap time even more with this new batch of limited-time deals from IKEA, because you can take $200.00 off a FRIHETEN Sofa-Bed or a LEIRSUND Adjustable Slatted Bed Base until February 13! The $200.00 discount is only applicable to FRIHETEN Sofa-Beds in Skiftebo Dark Gray and there are two options -- one with storage and one without. We've listed both products along with all eligible LEIRSUND Bed Base sizes below. These offers are effective until February 18 online, in IKEA stores and at Pick-up and Order Points, with a limit of four per customer. Before you shop, read our guide with tips on how to shop at IKEA like a pro! Wish the King size was on sale too. I wish there was more info. Had does one lift it? I assume you can't use a box spring etc. Would sit pretty low to ground etc. Can it have a headboard or would that mess with the lifting? It's a slat base, not a frame. It sits in an Ikea frame (sold separately). May pick one up. Thanks OP. FYI - FULL is on sale for $50 as well. - when you're really tired and ready to sleep, you have to get out of bed and lift up the frame/mattress front to reset it back to the bottom? Note that the FULL photo may not be correct. It may only be one section. The double bed is ok to lift up and down but the queen requires 2 people. The straps are very short so I had to add rope through both straps to be able to reach them. Good idea but not easy to lift and put down. On a king size bed it's a 3 man job to use the adjustable component. Buy extra pillows. There's my analysis of the deal. Great price if you know what you'll be getting. Thanks for a detailed description, that would help lots of potential buyers. So I would put this in my ikea bedframe so I can raise the back and sit on it like a hospital bed as long as my mattress is foam? It's a steep discount, but you really have to wonder how practical it is since it's not one-button automatic. If you want to read in bed or watch TV, sure, but it's easier to prop up a few pillows than to get out of bed and adjust it. Unless you spend a lot of time in bed not sleeping I would save the $50. Even if you never use the 'lift' adjustment, this is a better base than the Luroy and Lonset for a crazy low price. More slats, more comfort zones, and tension adjustment on the middle slats. I don't have a bed. Can this be used directly on the floor? Buying this to raise my mattress off the floor. I got the luroy slats for my queen bed. They are garbage. Because they are bowed, when I move it either compresses or springs back, so then it rubs on the metal and creaks...every...single..time. too bad i'm over the return period. I used wood cut from 1x3 before and it worked better than these slats. Can this base be used to slant a mattress similar to the picture below? Thanks, will see if this makes my bed more comfy. Thanks OP. I just set it up and can confirm it works with a Jysk bed frame as well. Setup was easy, the zones mean we can each have a comfort setting we like and it made a big difference over the former wooden slats which was on the frame originally. Build quality is impressive and I noticed a difference in the mattress already.